Southern Fabric has been an online fabric shop since 2004. They are located in the heart of middle Georgia, have a very experienced staff that specializes in customer service, and sell top quality quilting fabrics and precuts from Art Gallery Fabrics, Moda, Westminster, Free Spirit, Riley Blake and many more! 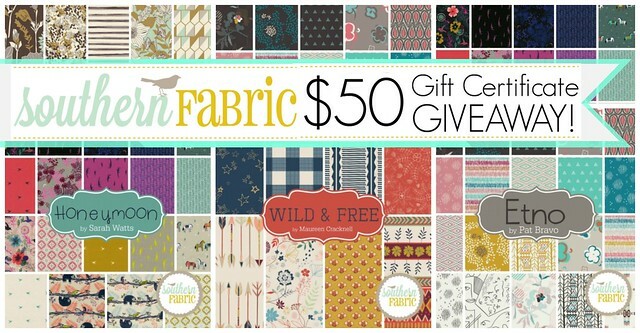 For this weekend's Fabric Giveaway Southern Fabric is offering the winner a $50 shop Gift Certificate! A generous prize amount to spend on anything in the store from their New Arrivals section including Bonnie Christine's Cultivate, Skopelos by Katarina Roccella, and new offering from Moda and Riley Blake -- to their sale section including hundreds of newly marked down prints for up to 50% Off! That’s 4 possible entries! Enter now through Monday, June 27th. The winner will be randomly chosen and I will announce their name at the bottom of this post, right here on the blog! Thank you to all who entered our Giveaway! From 667 entries, comment #204 was chosen at random, Connie Cain! Congratulations, I will be in touch shortly!! Wow what a great giveaway! It would be so hard to choose a favorite, but I would go with Joyeux Noel by French General. Thanks! Another great giveaway, thanks to you and your sponsors. I love Southern Fabrics bundles!! Paradiso, Aloho girl are two I have my eye on. I follow SF on my blog reader. I follow you on my blog reader too :) Have a great day. I really like the Winter berry. Those reds just touch my fancy. I follow you and I love all the fabric. I think I'd purchase the Feed Company bundle. There's just something about those red pickup trucks that appeals to me! I would like to have the white low volume precut bundle! I think I'd pick the Playful bundle! Great giveaway. Of course I'd pick a bundle of Wild and Free and make a wonderful quilt. I follow you here on your blog, Maureen. I also follow you on Facebook. I love the cultivate bundle - beautifully soft pallet perfect for a comforting quilt. I follow you on Bloglovin - great inspiration! I'd pick the big Etno bundle. What an amazing and generous prize!! !I'd love either Hollys Tree Farm or Reel Time!!! The awesomely curated violet and purple FQ bundle! My stash is low on these colors. I am already following Southern Fabric on FB!!! Love them! I'd grab a bundle of zephyr! I'm following you on FB - thanks. I follow Southern Fabrics via email. Thanks. Would love to get the Honeymoon bundle! I would love to add Sea Buddies Girl to my stash! Usually I'm more about Happy Vibrant colors but today I'm feeling Heartfelt but Kansas... something. I have to go with Wild and Free. Beautiful. I follow Southern Fabric on via e-mail, and FB. I love Aloha Girl! So beautiful! Winterberry would be the bundle I chose, difficult decision though it is. I follow Southern Fabric on FB under Jonquil Alexia. I follow you on Instagram under jonquilsgrdn. I would be happy with just about any bundle of fabric, they are all pretty. Thank you for the chance to win. I love the Wild & Free Collection!!! I follow you on Bloglovin!!!! I'd have to go for a bundle of Feed Company by Sweetwater. Thanks for the chance to win. I get the Southern Fabrics newsletter and follow them in Bloglovin. I am your follower on Bloglovin and by email. I love the white low volume bundle. Those are always a good addition to the stash. Thanks! Excellent giveaway! I would want to get some Wild and Free! I have been eyeing it for a while and after seeing all your beautiful projects with it, it's time to get some for myself. I follow MCH on Facebook and Bloglovin. HI, I'd select "Flutterberry">neat bundle! HAPPY TO FOLLOW MCH ON BLOG LOVIN' ! HAPPY TO FOLLOW SOUTHERN FABRICS ON FB ! I would love to add the Miss Kate - Fat Quarter Bundle by Bonnie and Camille for Moda to my tiny stash. I follow Southern Fabric on Facebook as Kathy Newsom Davis. Great giveaway, Southern Fabric is tops. I'm following you on Bloglovin', FB, and Instagram. I love the Elizabeth by Tula Pink bundle. Thanks for the opportunity to win. DYING to get my hands on one of the Skopelos bundles :) Thanks for sharing! Now following Southern Fabric on FB. I can't wait to pick up the flutterberry collection! I might have to buy it now...hope I win so I can pick another! Oh, I would love a bundle of Brambleberry Ridge Mist. I follow you via email and on Facebook. I love the wild and free!! I would love to own the Glitz Garden Fat Quarter Bundle (MM.GG.15FQ) by Michael Miller, the soft yet vibrant colors are spectacular. I do follow you by email and have signed up to follow on facebook the Southern Fabric fabric store. Thank you for sharing and giving the opportunity to win such a Great gift! Have a wonderful creative day! Love, love the "Modern Minis" line! Actually, anything that Lori Holt has touched is wonderful. Joyous Noel is my pick. Love this line. I am a faithful follower of your blog also.. I love the vibrancy of True Colours by Tula Pink, but I would be so delighted with any of them - they are all great - thank you. I "like" Southern Fabrics on FB - and who the heck wouldn't!!!! I follow Southern Fabrics on FB. ... and I follow you via Bloglovin! What a generous giveaway! I would have to choose between Paradiso by Kate Spain and Aviary by Joel Dewberry! I would select Wild and Free. Nice! I would love a 'Wild and Free' bundle. I love, love, love that arrow fabric! I love the Flutterberry Fat Quarter Bundle. Would make a cute quilt for my granddaughter. I'd love to get the Cotton and Steel splash bundle. Kind of in love with Cultivate and Winterberry at the moment! Awesome giveaway! I'm liking Homebody or Playful a whole bunch! Thanks for the opportunity! Wild and Free would be my pick! I would like Winterberry for a holiday quilt. The Etno Dainty Folk just screamed me and I love it! There are so many bundles to look at! The Cotton + Steel's splash basics is so pretty, I'd have to pick that one! I posted this giveaway on Facebook! You always have excellent giveaways. Thanks for a chance to win. I would like the dark blue bundle or Day sail neutral . I get Southern Fabrics newsletter . Thank you . I follow you & share on Facebook and Instagram . Thank you . I would most like the Skopelos Sea half yard bundle---I can't get enough of those colors! Ooh, I really want some Michael Miller Glitz! Great giveaway!!! I love the BEACH HOUSE - FAT QUARTER BUNDLE. Thanks to Southern Fabric for a great giveaway. I am already subscribed to the Southern Fabrics newsletter. Maureen, I follow your newsletter and admire your creativity. I follow Southern Fabrics on Facebook. Picnic looks like such a cute bundle! I'm crushing on the cultivate fat quater bundle. Daysail, love me some Daysail! Thanks for the chance to win! I love the pinks and the blues in Paradiso. I've been trying not to buy bundles and use up some bundles I have so I've only been buying backings lately. It was fun to look at those stacks of deliciousness. Light Blue and Aqua - Fat Quarter Bundle...if I have to pick one, today this would be it.